Popular commercial formulation for large volume microalgae cultures. FAF product, used throughout the world on the largest shrimp and invertebrate farms. A modified, premeasured, dry Guillard’s f/2 fertilizer formula. Eliminate costs of obtaining and maintaining large inventories of ingredients and the time needed to weigh out major and minor ingredients. Premeasured technical and reagent grade ingredients eliminate costly mistakes by inexperienced technicians. 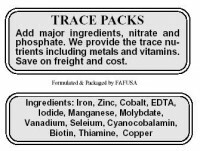 Mass Packs include major and minor nutrients, you just add the water and mix. Majors, nitrate, phosphate and iron are in dry form or moist form and minors including vitamins and trace metals, are liquid. Light weight mix provides great savings in shipping costs over standard liquid formulations. One box only weighs 2.2 pounds which is enough to fertilize 10,000 L (2,645 gallons) at f/2 level at a very low cost per gallon or per liter (100 pack price without shipping costs). Liquid fertilizers weigh about 7.5+ lbs. for the same amount of fertilizer. Why pay for water? This stable wet/dry formulation assures longer shelf life and is easily mixed. Once mixed, store in a cool dark area to help reduce precipitation and deterioration, lasts 3-4 months after mixing. Considered a 5.1 hazard class chemical in dry form. Large volumes, must be sent by truck or ship. However we offer a moist formula which is suitable for normal shipping in low volumes. ORDERS WITH 300 PACKS OR MORE WILL HAVE PART A AND PART C PACKAGED IN BULK ONLY NO EXCEPTIONS.